My rating: 8/10. Retro style watch. Very affordable. Hello, today I’m doing a Casio A168W-1 review. It’s another popular affordable Casio watch, I’m aiming to slowly try and feature most of the top Casio watches available. I hope you enjoy this Casio A168W-1 review below. This is another popular retro design that will remind many people of the 80s once they pop it on. The classic style with its rectangular casing design is ideal for those who love these old Casio watches. The LCD digital display is easy to read and comes with an electro luminescent backlight for easier reading in dim lit conditions. 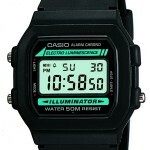 This Retro Casio watch is a little more expensive than the previous models, and with that comes a better quality glass. The watch has a mineral crystal glass that gives you a good level of scratch resistant, as well as being fairly shatter resistant too. At the heart of the A168W-1 is a Japanese quartz movement. This is a reliable and accurate movement that requires very little maintenance to stay running for years. Like the other retro Casio watches I’ve featured today, this model has that classic smaller casing size. The casing diameter measures 32mm and has a 7mm thickness. This makes it a fairly small watch that’s ideal for those who dislike all these modern larger watches. It’s also great for those with smaller wrists, as it will likely fit better. The strap is made of a silver metal and fastens with a clip over style clasp. These are quite popular as they’re very easy to adjust the size of. It measures about 18mm wide going well with the casing sizes. Extra features of this classic Casio timepiece include a stopwatch, alarm function, date display, and a useful backlight. The watch does have a pretty basic water resistant rating at 30m. 30m or 3 bar as it’s also known, make this watch suitable for everyday use. Splash/rain resistant. Not suitable for showering, bathing, swimming, snorkelling, water related work and fishing. Band Silver metal strap, standard length, 18mm width, clip over style clasp. Case Resin/metal casing, sizing diameter: 32mm and thickness: 7mm. Again we have another popular retro Casio watch that will remind you of that classic 80s style. The watch features a mineral crystal glass and metal strap making it slightly higher end than the previous Casio watches features. Overall it’s bound to suit those who are after a simple classic looking timepiece and require functions like the alarm of stopwatch. Hope you enjoyed this Casio A168W-1 review. Find more watch reviews below.